(8 Dec 2017) In collaboration and as an approved rescue partner, Delaware Valley Golden Retriever Rescue will be receiving dogs from South Korea rescued by Humane Society International (HSI). Animal rescuers from HSI have saved more than 170 dogs languishing on a squalid dog meat farm in South Korea. HSI is flying the dogs to shelters in the United States, Canada and the United Kingdom to receive care and rehabilitation. DVGRR was chosen by HSI because of our outstanding care, rehabilitation, training, and adoption programs. After the dogs are brought back to DVGRR and examined, we’ll have more information about the dogs we’ve received and let everyone know when they are available for adoption. More information coming! SEOUL (5 Dec 2017) by Humane Society International – Animal rescuers from Humane Society International have saved more than 170 dogs languishing on a squalid dog meat farm in South Korea, a mere two hour drive from where the country will host the 2018 Winter Olympics in 10 weeks’ time. The charity is flying the dogs to shelters in the United States, Canada and the United Kingdom to receive care and rehabilitation. Information on adoption will be available at a later date. The dog meat farm in Namyangju is one of an estimated 17,000 dog farms in South Korea breeding more than 2.5 million dogs a year for human consumption. It is a grim, shocking and largely hidden side of South Korea that is in stark contrast to the colourful pomp and ceremony of the Olympic festivities, and one that a growing number of South Koreans believe has no place in their modern, progressive society. The stated vision of the 23rd Winter Olympic Games is ‘new horizons’, explicitly appealing to the younger generation and aspiring to create a ‘cultural new horizon’ where traditional and world culture converge. HSI believes that with young Koreans increasingly rejecting dog eating, there has never been a better time to phase out the dog meat trade and usher in the ‘cultural new horizon’ of compassion. 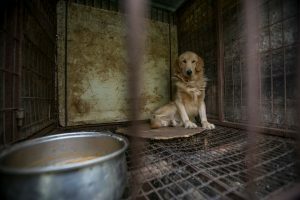 At the Namyangju farm, dogs including golden retrievers, spaniels, beagles, greyhounds as well as Korean jindos and mastiffs, were being kept in filthy and deprived conditions, spending their whole lives in rows of barren wire cages, exposed to the elements and with no veterinary care whatsoever. HSI found many of the dogs suffering from eye infections, skin disease, as well as painful leg and paw sores from endless days of standing and sitting on thin wire mesh. Their fate would have been to be killed by electrocution at the local market or slaughterhouse and made into a spicy soup called bosintang, but instead they’ve been saved by HSI as part of the charity’s campaign to see an end to the brutal dog meat trade. HSI has been working on the ground in South Korea for the past three years; this is the tenth dog farm the charity has permanently closed, working in partnership with dog meat farmers keen to leave the trade. 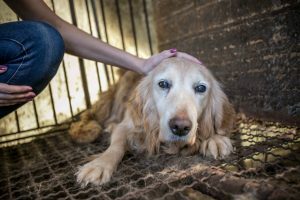 A combination of growing societal shame, increased difficulty in selling dogs as appetite for dog meat declines, and regret at the suffering of dogs, leads farmers to approach HSI for a practical ‘way out’. While for some very elderly dog farmers, HSI intervention has meant they can finally retire without the hard physical labour of dog farming and without having to sell their dogs for slaughter, others work with HSI to devise a business plan to transition them into alternative, humane livelihoods such as water delivery or blueberry farming. Mr Kim, who has been farming dogs for twenty years, plans to enter the construction business and to grow vegetables on his land. It’s a blueprint for change that HSI hopes the Korean government under President Moon Jae-In will adopt. HSI has saved a total of 1,222 dogs so far from South Korea’s dog meat trade, like gentle giant Clint the mastiff who recently starred in a PSA video with Criminal Minds actor Daniel Henney, and little Caspian who went from dog farm horror to Ambassadorial luxury when adopted by the British Ambassador to South Korea. Take action! To say ‘no’ to South Korea’s dog meat trade, sign HSI’s petition in English or Korean – signatures will be submitted to the South Korean government. Most people in South Korea don’t regularly eat dog meat. In fact, opposition to eating dog is growing among Korean citizens, and the newly elected President Moon Jae-in recently adopted a dog named Tory who was said to be rescued from a dog meat farm. Most dog meat — up to 80 percent – is eaten during the hottest days of summer, called Bok Nal. Dog meat is usually made into a soup called bosintang. Small dogs can also be made into a herbal drink called Gaesoju. While some very elderly dog farmers with whom HSI works choose to retire, others work with HSI to devise a business plan to transition into alternative, humane livelihoods such as water delivery or blueberry farming. Mr Kim plans to enter the construction business and to grow vegetables on his land. In summer 2017 Konkuk University’s Institute for the 3Rs and Korean Animal Welfare Association inspected dog meat from 93 vendors at 25 markets, and found that 64 percent of dog meat contained antibiotic residues (up to 490 times higher than antibiotic levels seen in other meat products such as beef or chicken). In addition, an earlier study by the Research Institute of Public Health & Environment (Seoul Metropolitan Government) showed that the dogs in the butcher shops of South Korea’s largest dog meat market, Moran Market , often carry potentially zoonotic bacteria (e.g. staphylococcus, colon bacillus), and traces of antibiotics exceeding hazardous health standard limits. Dogs are usually killed by electrocution taking up to five minutes to die, although there are instances of dogs taking up to 20 minutes to die. Hanging is also still used despite laws prohibiting this. 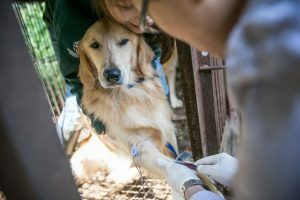 At each dog meat farm closure, HSI has a veterinarian test for the presence of the H3N2, or dog flu, virus at the time the dogs receive their rabies, DHPP, and coronavirus vaccines. HSI also vaccinates the dogs for distemper, parvo and coronavirus. HSI then quarantines the dogs on the farm (if they’re healthy and with added enrichment and constant monitoring) or at a temporary shelter with no dogs in or out for at least 30 days prior to transport.